I love Henna Conditioner by Mill Creek Botanicals! It is really nice for curly hair. Henna Conditioner by Mill Creek Botanicals helped repair & protect months of damage to my hair in just one use! Gentle enough for use on permed or color-treated hair. This exclusive blend of pure botanical Henna and plant Keratin protein does not impart color so it can be used on all hair colors to help condition and strengthen your hair. Argan Oil helps repair split ends and pump up volume for fullness and a lively bounce. This enhancing formula also contains Hops and Calendula to increase the shine and bounce of your hair. Deionized Water‚ *Organic Barbadensis (Aloe Vera) Leaf Juice‚ Lawsonia Inermis (Henna) Extract‚ Panthenol (Provitamin B5)‚ Hydrolysed Keratin‚ Stearalkonium Chloride (Fiber Based Content)‚ Biotin‚ Argania Spinosa (Argan) Oil‚ Glycerin‚ *Organic Prunus Serotina (Wild Cherry) Bark Extract‚ *Organic Chamomilla Recutita (Matricaria)Flower Extract‚ *Organic Hamaelis Virginiana (Witch Hazel) Leaf Extract‚ *Organic Hydrastis Canadensis (Golden Seal) Extract‚ *Organic Calendula Officinalis Flower Extract‚ *Organic Humulus Lupulus (Hops) Extract‚ *Organic Equisetum Arvense (Field Horsetail) Extract‚ Polysorbate-60‚ Cetearyl Alcohol‚ Citric Acid‚ Potassium Sorbate‚ Sodium Benzoate‚ Natural Fragrance. *Certified Organic Ingredients by USDA. Vegan / Vegetarian / Paraben-Free / Sulfate-Free / Gluten-Free / pH Balanced / Cruelty-Free. I have a LOT OF chemical allergies to fragrances and even ingredients included in many "all natural" hair care products. Henna Conditioner by Mill Creek Botanicals is one conditioner that I can safely use. It has a VERY mild fragrance and nothing I'm sensitive to at all! Love it! Henna Conditioner by Mill Creek Botanicals is a conditioner with weight. I wasn't sure at first that I liked Henna Conditioner by Mill Creek Botanicals. What I was used to felt so different. But what I noticed right away was that I had less hair in the drain. Tried my old stuff and there was the hair again. I went to order this again and they didn't have it anymore but I did find another Organic that I will try. This Henna Conditioner by Mill Creek Botanicals is not the best at moisturizing or taking away knots. It actually made my hair more knotty than other confitioners. It has a nice light scent. Helps repair damaged hair, restoring smoothness, shine & manageability. I was looking for the best value for money bulk sized natural and organic conditioner. 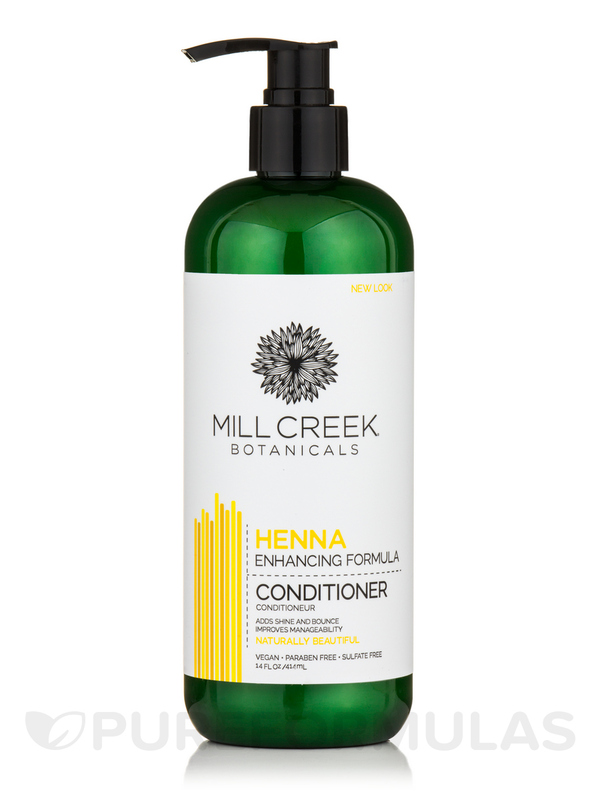 Henna Conditioner by Mill Creek Botanicals has overall really great ingredients, and gives good slip for easy detangling of my curly long hair. The smell is nice too not too overpowering.